Brenda used the Clamping Pin Cushion Box in Vintage Dove. Third in the sewing box series, shown on a 6" Black Iron Box from Lone Elm Lane. Published Dec 2013. A very beautiful design and palette. Queen Crown Box framing this pattern that allows customization of your house number. Beautiful! This beautiful pattern on a vintage slate box. Design size is 6x6 and the box is 8x8 inches in size. 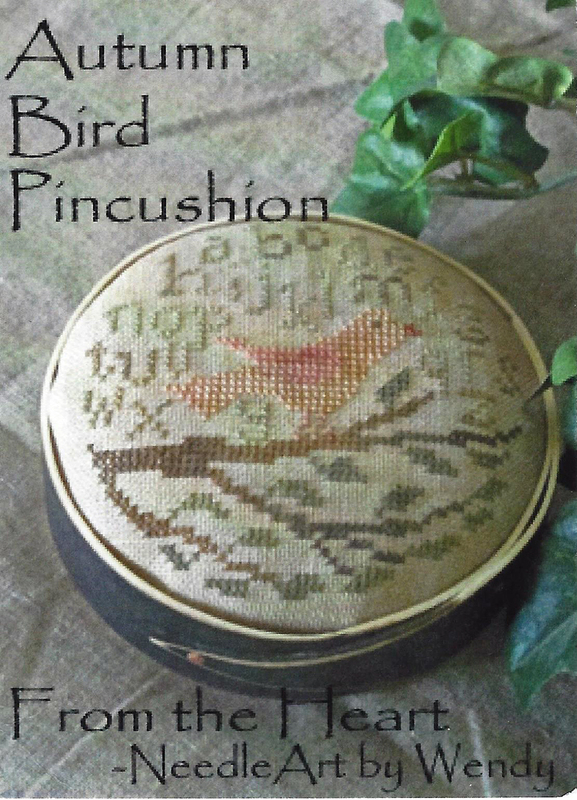 Two pincushion patterns are shown in the included wood pin tray. Vintage Slate 8x8 box fwith 6x6 pattern area, with traditional motifs that come together to make a stricking design and pin cushion designs included that fit in the wooden pin tray. Sunflower Cottage Sewing Box, with all the accessories, pin cushion, needle book, scissor fob and custom thread winder! 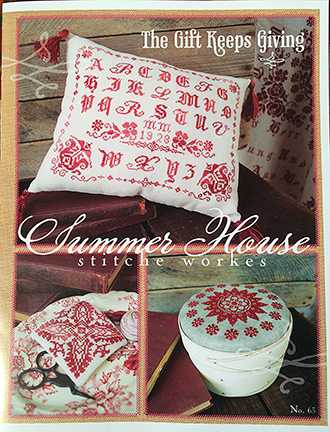 The accessories fopr Sunflower Cottage Sewing Box Pattern. Very detailed stitching on every piece, so pretty! Beautiful Pattern from Plum Street Samplers, Surprising colors with antique deer, shown on Dark Chocolate 8" Shaker Box from Lone Elm Lane. Unique colors create this surprising design, so very pretty on the Lone Elm Lane Robins Egg Blue 6" Shaker Box! Cherished Stitches presents a new pattern shown on Queen Crown Box in Dark Chocolate, traditional design with brighter colors, and verse. Box includes wooden pin tray! Sampler....Box Top for Shaker Box (Wooly White or Brick Red) and Needle keep, What a great design with solitary color throughout, Lovely pattern on the Shaker Box, intense colors!!! Such an awesome design, Shown on Vintage Slate Queen Crown Box. Very sharp pattern with striking colors! Personalize with Initials! Striking colors, This beautiful pattern sure makes the Vintage Slate Queen Crown Box look really good, WOW! A section of a Reproduction Sampler shown on Lone Elm Lanes Vintage Slate Box. More to come, very pretty! Such a beautiful fruit basket, great thread colors, they have done it again. Second in the sewing box series! Shown on a 6" Lone Elm Lane Shaker Box with drop top for mounting design.Blackbird First in the Sewing Box Series. Stitrched and mounted in the Lone Elm Lane 4" pincushion in Wooly White. Beautiful palette, always inspiring! FLEUR DE LYS FOR THEEThe design includes pin cushion and scissor fob and alphabet for Monogram. Shown on LEL's Vintage Slate Queen Crown Box with pin tray.This is an elegant pattern, like the name implies. These designers so graciously created patterns that fit Lone Elm Lane boxes. They really make our boxes look their best. We feel lucky!! Paulette of Plum Street samplers designed this awesome Autumn Ewe pattern for Lone Elm Lanes Petite Pedestal Frame.